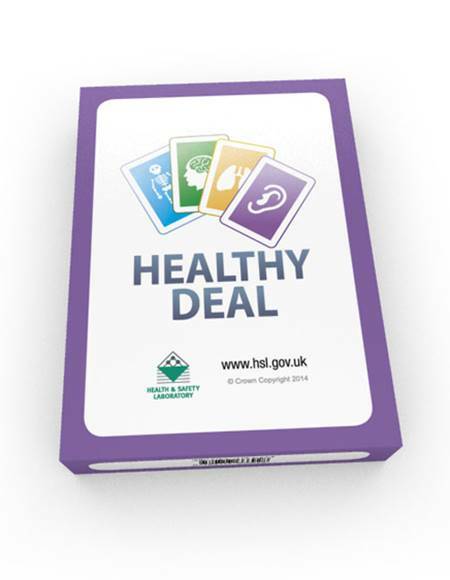 Healthy Deal is a set of playing cards that can be used to raise awareness about the 'health' in 'health and safety'. Each card contains useful information and questions about health risk management and prompts discussion about how your organisation approaches it. Healthy Deal is designed to be used by health and safety, occupational health and HR professionals with their leaders, managers and supervisors to raise the profile of health risk management to give it equal priority alongside safety. Evidence shows that taking an approach to worker protection that integrates employee health and wellbeing alongside safety offers the greatest benefits both to the individual and to the organisation. There is no fixed way to use the cards. You can ask the question first to start a conversation, then use the information provided to add context to the discussion. Alternatively you can use the information on the card to introduce the subject and then ask the related question to begin a discussion. Either way, Healthy Deal will generate interesting dialogue. As a result you will raise the profile of health risk management within your organisation and begin to identify issues and opportunities for improvement.